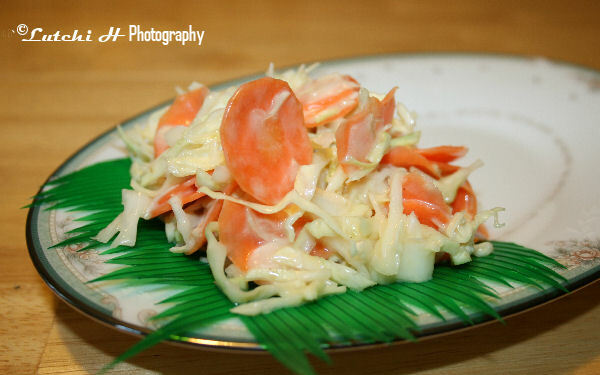 We had pork barbecue dinner southern style the other night and I made this coleslaw to go with it. If you love creamy, tart and sweet -style coleslaw then you have to make this one sometimes. My mom-in law had taught me how to make real southern style coleslaw. If you have food processor then you can use it to chop your vegetables. I have one but decided not to use it because I am only making for two persons. I did not add any green pepper too for some reason. 1. Mix chopped cabbage, carrot, bell pepper and onion in a large bowl. Set aside. 2. In another bowl, stir together all dressing ingredients until combined. 3. Taste your dressing to your likeness. You can always add honey/sugar if it’s too sour, or add vinegar if it’s too sweet. 4. Pour the dressing into the vegetable mixture and toss gently.